There are several theories that explain how the present continents were formed. In this article, we take a closer look at two of the more popular theories – continental drift and plate tectonics – to learn how they differ from each other. The continental drift theory explains that today’s continents were parts of a larger continent that drifted apart. 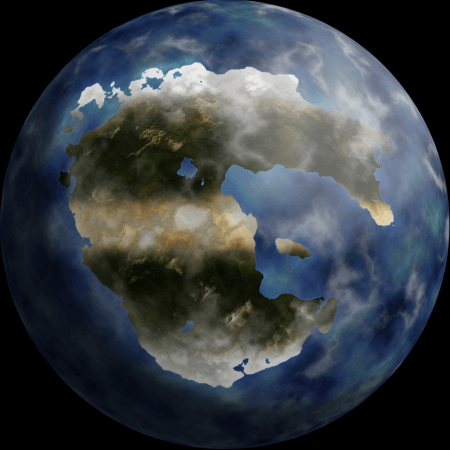 Scientists call the larger continent “Pangea” which they claim split apart into the seven land continents we have today. In 1912, Alfred Wegener, a German meteorologist, was the first to present a comprehensive theory concerning the continental drift. Wegener believed that the continents are composed of lighter rocks resting on heavier crust material just like an iceberg floating on the water. Wegener presented a good amount of evidence to back up his theory but failed to give plausible explanations as to how the continents might have drifted. His theory that the continents drifted apart due to the earth’s rotation was rejected. He further asserted that the relative positions of the continents are not as strong as it should be. This caused the continent to move ever so slowly at a speed of a single yard per century. He also theorized that the Atlantic did not exist until the continents slowly broke off to form the other continents. 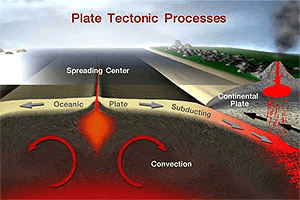 The plate tectonics theory refers to the large-scale movement of the seven major plates along with several other smaller plates that form the earth’s lithosphere, for the last hundreds of millions of years. The theory is based on the concept proposed by the continental drift model and was accepted by the geological community in the early 1960s. The plate tectonics theory states that the lithosphere, or the earth’s outer rigid layer, is made up of a few dozen plates moving across the surface of the earth, similar to how slabs of ice move above a lake’s surface. The earth ‘s outer layer is divided into two parts: the lithosphere (outer rigid layer) and the asthenosphere (generally solid region under the lithosphere). The theory suggests that the lithosphere is individual tectonic plates riding on the fluid-like but visco-elastic asthenosphere. Similar to a sheet of ice inching its way over water, the plates move somewhere between 0.4 and 6.3 inches (10 and 160 millimeters) each year. The movement of these plates is attributed to the intense heat coming from the earth’s core. This movement causes the plates to shift and slide, which in turn causes earthquakes and volcanic eruptions. So what’s the difference between continental drift and plate tectonics? The continental drift theory states that the continents were once parts of a supercontinent called Pangea. Alfred Wegener was the first to offer a comprehensive theory about continental drift but failed to provide a feasible explanation about how continents actually drifted apart. The plate tectonics theory is based on the continental drift theory in that it explains how the supercontinent drifted apart into several plates. It explains that the continents drifted apart because of the constant interaction between the earth’s tectonic plates and the heat of the earth’s core.